I’m no stranger to religion-themed films. Most the time, they bug the crap out of me, but there are a select few that I do typically enjoy. Specifically, I like when films have a secular take on a biblical story. Noah, for example, was done really well and took a lot of smart creative liberties at the same time. I say it all the time, the books in the Bible are actually good stories with great morals, but are constantly butchered by preachy filmmakers who focus more on converting you than they do the actual story – so they never have the guts to, let’s be honest here, be realistic. 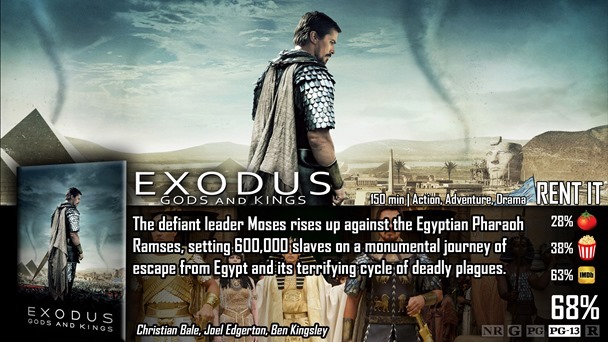 I was looking forward to Exodus: Gods and Kings for the same reason that I enjoyed Noah. Ridley Scott has come out saying he believes he is a better storyteller for being agnostic, because he has to convince himself that the story makes sense first. Does it? Sure, why not, but does it tell the story of Moses the way it should? I’m not entirely sure. I’m not going to sit here and pretend that you’ve never heard the story of Moses. It’s been told and retold seemingly a thousand times over, and it has once more been repeated…but a few creative liberties were taken in Ridley Scott’s portrayal. When it comes down to brass tax, he focused on a more realistic variation of the story that feels unique, changes things up, and still somewhat fits in with the story in the Bible. The main problem with that comes down to how they dealt with God…which like in Noah, came down to visions that may or may not be real. The problem with that, is Moses always worked hand-in-hand with God himself…and that’s not true here. To give you an idea, instead of Moses carrying the staff of god, and carrying out all of the events in the story (the plagues, splitting of the sea, etc), God basically tells Moses to stand in the sidelines and watch it all unfold…which understandably makes Moses upset in general, because he hasn’t yet let go of his Egyptian lifestyle. I’m completely fine with creative liberties because technically speaking, it was always God that made these things happen in the Bible as well, not Moses…I mostly just had a problem with Moses being sidelined. It was like Katniss in The Hunger Games: Mockingjay – Part 1. While they both played important roles in the films, they more or less did…nothing. For a 2.5 hour long film, you can’t just do nothing. Other than that, I can completely understand people’s insistence on blaming the film on changing everything. The story of Moses is an epic one all by itself, and you could almost see him as a Superhero with powers while reading it as a kid. For Christian Bale to play Moses, sit in the sidelines, and complain for two hours…it’s kind of disappointing to say the least. Now, it’s a very pretty movie, and the way they dealt with the plagues was awfully interesting and unique, but…you know…it was a little boring. What you won’t see me complaining about, however, is this stupid argument on an all-white cast. Could they have done a better job with appropriate actors? Maybe, maybe not, all I know is that the cast we have did a fine job as far as acting goes. They were given a script and they pulled it off. Let’s stop shaming them on it, because out of all of the flaws this film has, that has to be the least important. Exodus: Gods and Kings has a pretty good idea going for it, and offers its audience a brand new and unique take on the story of Moses – which all in all, isn’t as bad as people put it out to be. The biggest problem I had with this film was that Moses was sidelined for most of the film because God wanted to take over and get things done…which is when Moses just starts complaining all the time. 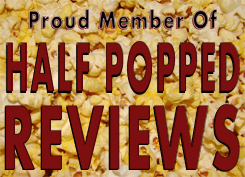 If you thought this film was boring – that’s probably why. Another reason is because the film tried to be very realistic and the things you expected to see happen…don’t…or at least not in the way you were expecting (to be fair, that could be a good or bad thing). Good review Dave. Honestly, I don’t understand why Scott ever bothered with this story in the first place.